Who wouldn't want to start out their day with a little magic! I think some of my niece Mycol's first words were "Magic Syrup". The now 11 year old won't eat pancakes, french toast, or waffles with out this amazing syrup. I had to get the recipe years ago so I could make it when the kids came over for weekend sleepovers. My nieces and nephew can't live with out it. So let this be a fair warning for you...if you dare introduce a little magic to your kids, you may have to start stalking buttermilk on a regular basis. 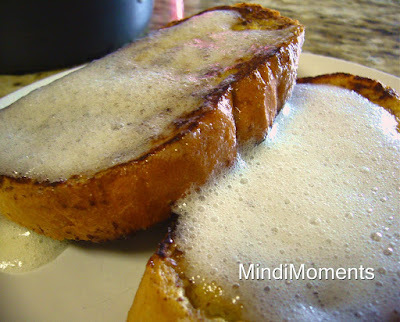 Pair it with my favorite French toast and you'll have a winner all the way around! 1. The night before, cut the French bread into 1 inch slices. Lay flat on a baking sheet and cover with a dish towel. Allow to sit overnight. 2. In the morning, mix 2 eggs, 1/8 C. milk, 1 t. vanilla, 1 t. cinnamon, and ½ t. nutmeg. Blend well in a shallow dish such as a pie plate or baking dish. 3. Dip each piece of French bread into the egg mixture and cook over medium heat on a griddle or skillet. 4. Cook half the French bread slices, then make another egg mixture using the other half of all the ingredients. 5. Continue to cook the rest of the French bread slices. 6. Serve with magic syrup. 1. Combine the buttermilk, sugar, butter, and corn syrup in a large pot. 2. Bring to a boil for 1 minute, and then add the baking soda. 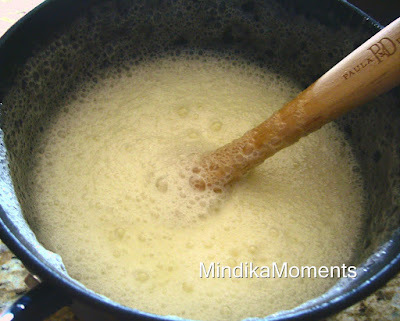 When you add the baking soda the syrup will immediately triple in volume, so be sure and use a large pot. *The syrup will be a foamy consistency. However, as it cools it will loose it's foaminess (is that a word??). Anyway, it still tastes the same, but it's a little more concentrated. If you want to make it foamy again, just heat it back up in the microwave or over the stove. I usually don't worry about the foam. I eat it just as a normal syrup. I have a similar recipe for syrup but it always turns thick and carmely. I will try your recipe. Thank you.